Dash Door & Closer Service, Inc., one of Florida’s largest independent automatic door suppliers and specialty glass contractors, continues its investment in new executive talent with the hiring of Scott Schneider as Chief Financial Officer (CFO). Mr. Schneider will report to Dash Door’s chief executive officer, Steve Sanko, and will be a part of the company’s senior leadership team. Mr. Schneider is an accomplished executive bringing with him an extensive background in strategic planning, performance management, corporate finance, financial planning and analysis, tax, and risk management. “Dash Door has been experiencing tremendous growth, and as we expand our product and service offerings, Scott’s financial and operational expertise will be an exceptional addition to our team,” says Steve Sanko, CEO of Dash Door. With more than 17 years of management experience, Schneider joins Dash Door from Kaufman Rossin where he led the business consulting practice. 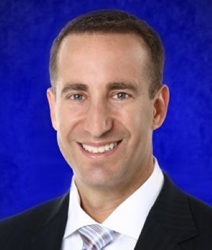 Before joining Kaufman Rossin, he worked at Deloitte Consulting LLP for six years. A certified public accountant and a chartered financial analyst, he earned a master of business administration from the Fuqua School of Business at Duke University and a Master of Accounting from the University of Florida. "It is a tremendous opportunity to join Dash Door at such an exciting time," said Schneider. "I'm looking forward to helping Dash Door succeed in the next phases of its strategic transformation." About Dash Door – Dash Door & Closer Service, Inc. is one of the oldest and most respected independent commercial automatic door distribution, installation and service centers in the United States. Over the decades, Dash Door has evolved to serve in multiple roles for various client types in South Florida: facility maintenance partner, specialty glazing contractor, door hardware consultant / supplier and access control / security integrator. Dash Door offers an extensive line of product and service offerings encompassing all types of door, hardware and glazing solutions across our service groups. Learn more at https://www.dashdoor.com/.